I remember being amazed when I was little and watched my mom wrapping presents. My favorite part was when she would cut the paper with one smooth slice with the scissors. I would always hack at the paper when I tried to help. I eventually got the hang of it and now I wrap better than my wife. This was great. Very funny. Thanks Chris! I liked the golden scissors. I love the way Biff is reverently swiping the golden scissors up in the air like Link brandishing the Triforce. Gotta love the action pose. Wow, I this is the highest in the posting ranks I’ve ever been! I love gift wrapping stuff; I’ve gotten better than my wife at it, as well. I especially love wrapping joke gifts. I’ll go all-out and get beautiful paper, ribbons, stickers, a large box with a seperate lid, and combine it all into something that would make a kid drop to his knees and drool pure greed when they see it. Then when they open it they get a single hershey kiss or something else completely inappropriate to the size of the box. Though to prove I’m not a complete d**k, I always tape a fairly substantial gift card to the bottom of the box’s lid, where they won’t look until after they’ve inspected the main area of the box. @Tim: Whoa.It does seem like he`s Link.`Cept,I was thinking more of a Master Sword Pose,like from TP or WW. I`m not a master wrapper,but I`m good myself. @Gobbledegook:My uncle did that to my sister.It was a box within a box within a box within a box within a box.The last box had a bracelet,I think. I hate packages wrapped in so much tape, I can’t open them. ~Gobbledegook I am so trying that. Although, last year I got a puzzle for my brother and wrapped every piece individually, then resealed the box like it had never been opened and wrapped that, so I probably shouldn’t do two jokes in a row. Caroline was good too, she gave me a shoebox sized present, and I had to keep unwrapping, and unwrapping, and eventually got to the pendant coiled up in the middle that was about the size of my thumb. Where can I get me a pair of golden scissors? My wrapping is never straight. No matter how perfectly I place the package in the center of the paper, something always folds wrong and the paper sticks out at weird angles. Got my pre-order ready. Love the strip. Entropic Voight – Awesome. Thanks for the order! 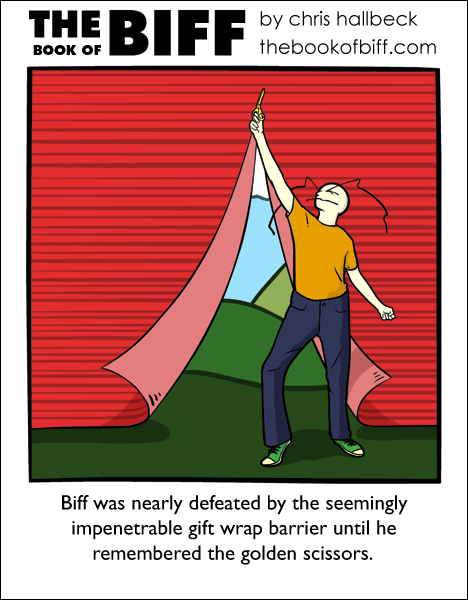 I love hacking and slashing through gift wrap. that explains it. i always come to see biff’s latest adventure at midnight and i was confused that it wasn’t here. I was starting to think it was the weekend. Wow Biff is now my calender. also, can anyone give me a link to the boidz comic? I just put some aluminum foil around the present and call it a day! I’m the best I just spraypaint the outside of the box. My mother bought my youngest brother a playstation game he’d been begging for for months for christams one year. Then she bought a box of the fanciest chocolates she could find and wandered around the store offering them to everyone, wishing everyone merry christmas. She then taped the disc to the bottom of the empty chocolate box and put the plastic trays back in on top of it. She added a note saying “Sorry dude, I got hungry. Merry Christmas, love Santa” and wrapped the box. My brother didn’t realise there was a game inside it until he saw it reflecting the tree lights as it flew across the room. Since then, he hasn’t had a serious present for anything from either me or my mother. The year we bought him a PS2 (after 4 months of being told “I’m not buying you another playstation”.. he was gutted when he found out it had been in the cupboard for 5 months) he would have walked maybe 10 miles, going back and forth between neighbours’ houses. He got sent on a FFVIII based “quest”, finding clues and doing tasks all day. The last one was a note saying he had to head home because something suspicious had turned up. We wrapped the console up to look like a bomb.. He just about killed us when he got it open. He still has it though. “Do not use without adult supervision.” *looks at Superman 400 ft away. * All good!